If you live in a warm climate or do a lot of baby carrying in the summer, you need to consider buying a baby carrier for hot weather. 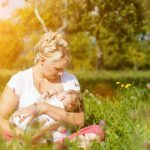 Having plenty of fabric tied around your body coupled with the warmth of your baby can become uncomfortable for both of you and significantly reduce the amount of time you can spend wearing a carrier. Meanwhile, the UV rays can be harmful for the baby. 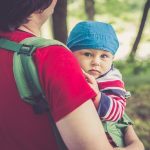 Some baby carriers are specifically designed for hot weather while others are versatile enough to be a great choice for both winter and the summer. Here are a few things you need to pay attention to when choosing the best baby carriers for summer. If you are planning to spend a long time out in the sun, you have to think about protecting your baby, who might be too young to wear sunscreen. If you like taking long walks on the beach or plan to go sightseeing out in the sun, you have to consider baby carriers with UV protection. In order for the baby carrier to offer such protection, the manufacturers use the special Rayosan process that increases the UV protection factor of the fabric without changing its properties. You have to give your baby an extra coverage when taking her out to the sun. This coverage is usually provided by a special hood, which can also serve as rain protection. If you are considering a sling, make sure the tails are long enough to cover the baby. However, the hood is the most convenient way to protect the baby’s head. Not all hoods are created equal. Many manufacturers overlook the importance of such hoods and make them too small or hard to handle. When you read the reviews, pay attention to how useful the hood actually is. Fabric is the most important factor you need to consider when choosing the best baby carrier for hot weather. You need special fabric, which is breathable and light. Look for baby carriers that are made out of linen and have mesh lining. 100% cotton or organic cotton fabrics are also breathable. However, cotton may be different. While being breathable, it can be thick and sturdy. Accordingly reading the reviews is a good idea. Many soft structured carriers are equipped with zippers to allow for extra ventilation. You can zip away the top panel of the carrier and allow the air to circulate. Meanwhile, such carriers as ring slings and Mei-Tais are pretty open so they allow the ventilation naturally. Carrying the baby on your back is always a good idea during warm weather. If the baby is old enough for the back carry position, it should be the option of choice. That’s why when it comes to hot weather use, it’s important to consider a baby carrier with a back carry option. Unless you live in a warm climate, you might not be able to use a 100 % summer baby carrier all year round. When choosing the best baby carrier for hot weather, consider the cold season as well. Many manufacturers offer versatile carriers that can be used both in the summer and winter. Such carriers are usually SSCs that have mesh lining and detachable panels. If you are thinking of spending the hot summer days at the beach, you might want to consider carriers designed for water activities. They are made out of special fast drying fabric. Dark colors attract sun rays. That’s why you need to choose the lightest possible colors for your summer baby carrier. White and beige are the best way to go. Try to avoid black, brown, dark green and blue baby carriers. RayosanTM treated fabric allows you not to worry about your baby being exposed to the sun. Powerful 50+ protection factor is more than enough to keep the child safe without any sunscreen. The baby carrier is made out of 100% cotton. The breathable material keeps the sweating to a minimum even considering all the layers of fabric around the baby. Moby Wrap is a versatile carrier that can be used all year round. You can wrap more fabric around the baby to make it feel warmer in the winter. Moby wrap offers a back carry option. Even though it’s a bit tricky to accomplish, back baby carrying is preferable in the hot weather. Since Moby Wrap is essentially a big piece of fabric, it’s easy to tie it in a way to offer head protection for the baby so it’s hidden from the sun rays. Besides giving the UV protection for your baby, the Moby wrap protects your body from the sun as well. Moby wrap comes in a variety of colors so you can choose the lightest one possible for comfortable summer wearing. Moby wrap is machine washable. The baby is always in an ergonomic position. The wide piece of fabric allows for even weight distribution over your back and shoulders. The Moby wraps come in a wide variety of colors and prints, including reversible options. This carrier has a rather high learning curve, especially when it comes to back carry position. Parents need to spend some time getting a hang of putting the wrap on, which might not be comfortable when it’s hot outside. The long tails of the fabric drag on the ground when you put the carrier on and tend to get dirty fast. This baby carrier is designed specifically for outdoor activities. That’s why it does a great job keeping the parent and the baby cool even in hot and humid weather. The carrier has flexible straps, a mesh panel, and a large supportive belt. This model is ergonomic so the support for the baby is truly impressive. This carrier is suitable for babies from 3.2 kg (with infant insert) to 20 kg. The material this baby carrier is made out of wicks away the moisture and dries very quickly. This is a perfect property for hot and humid weather conditions. This baby carrier is impressively lightweight. This takes the extra strain off the parent’s back while keeping the sweating to a minimum. The carrier is equipped with zipped pockets, which make the need for extra bags unnecessary. This is a big advantage for hot weather when carrying too many bags can reduce the duration of your walks. A special baby hood keeps the baby’s head safe from the sunrays. The hood is big enough for comfortable coverage and can be folded into a special pocket when not in use. It’s made out of water repellant material and is adjustable to the baby’s size. 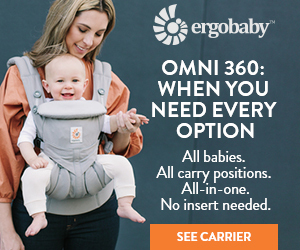 The carrier features a front, hip, and back carry option. A back carry option is preferable for hot days. The mesh lining allows the air to circulate and keeps both parent and the baby cool. Wide and padded shoulder straps allow for comfortable and lengthy carrying. The baby carrier is easy to clean and it takes very little time to dry. The carrier is highly adjustable and allows for comfortable breastfeeding. The learning curve is low, which is an advantage for both parents. 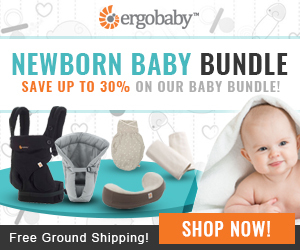 The infant insert is somewhat bulky and can make the baby carrying less comfortable. Essentially, this is the best baby carrier for hot weather unless you need to carry an infant. While being lightweight, this carrier is not too foldable so it can’t be stored in a small space and is bulky to carry around when not in use. The carrier is not suitable for petite parents. Ring slings are probably the best baby carriers for summer due to the lightweight fabric and absence of any padded straps or waistbands. While they can be tricky to put on, these carriers can become irreplaceable assistants for parents carrying their children in hot weather. Moms and dads, who are ready to conquer a high learning curve, can appreciate this affordable and cool option. You can choose Sakura Bloom ring sling made out of the lightest and breathable fabric that won’t have you sweating during long walks with your baby. The fabric is so breathable and light, it dries very quickly. There aren’t any padded straps, buckles or clips that require plenty of turning and twisting that’s not very comfortable in hot weather. This baby carrier is very compact. You can fold it and carry it around in a diaper bag. The fabric is flexible enough to allow you to cover your baby’s head to protect it from the sun. Sakura Bloom ring sling allows for simple breastfeeding. It’s easy to transfer the sleeping baby from the parent to a bed without disturbing her sleep. Hip carry position is easy to achieve for toddlers. This sling comes in a variety of colors, including the lightest ones that don’t attract the sun rays. You can choose from several fabrics, including linen and silk. There is no back carry position for small babies. However, even front and hip carry aren’t hot with this ring sling. A toddler can be put into a back carry position. High learning curve is a disadvantage for many parents who don’t have the time to master the ring sling baby carrying. Ring slings are mostly designed for small babies. Wearing a toddler can put a big strain on your back and shoulders unless you manage to master a back carry position.